The Historic New Orleans Collection presents a panel version of Purchased Lives: The American Slave Trade from 1808 to 1865 at its Williams Research Center, 410 Chartres Street. Based on content in the exhibition of original artifacts, the vibrant and informative panels feature reproductions of the artifacts, along with text detailing the many facets and effects of the domestic slave trade. 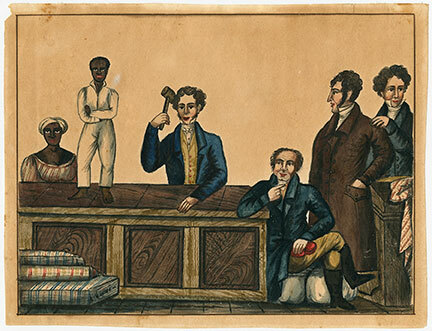 Curated by former THNOC historian Erin M. Greenwald, Purchased Lives examines the period between America’s 1808 abolition of the international slave trade and the end of the Civil War, during which an estimated two million people were forcibly moved within the confines of the United States. The domestic trade wreaked new havoc on the lives of enslaved families, as owners and traders in the Upper South—Maryland, North Carolina, Virginia and Washington, DC—sold and shipped surplus laborers to the developing Lower South—Alabama, Florida, Louisiana, Mississippi and Texas. Many of those individuals passed through New Orleans, which was the largest slave market in antebellum America. The exhibition’s narrative is not limited to New Orleans, however. It examines a complex and divisive period of American history, helping viewers learn about the far-reaching economic and heartbreaking personal impact of the domestic slave trade. During its 2015 run at THNOC’s Williams Research Center, Purchased Lives deeply impacted visitors, many of whom returned for two, three, four or more visits. In total, more than 15,000 people visited the display, with the final day seeing 667 people. By comparison, that same space saw 14,000 people during all of 2014.